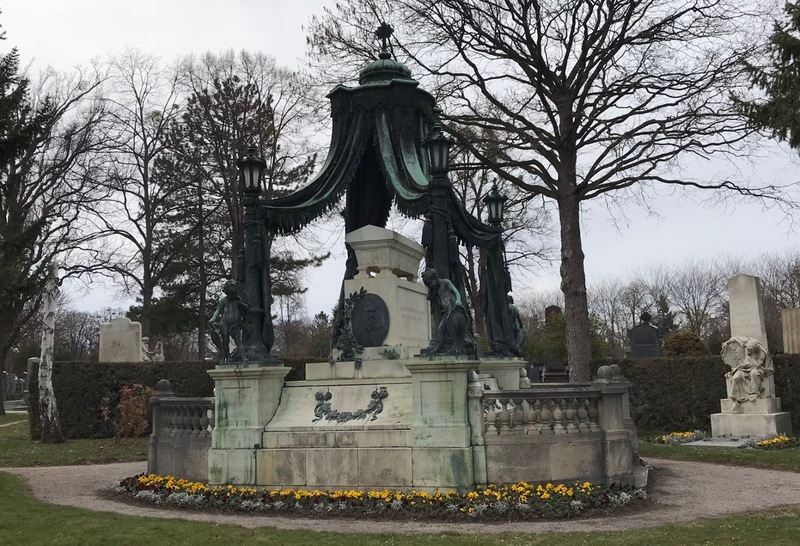 Balkans & Beyond, Days 4 & 5: Vienna, Austria. 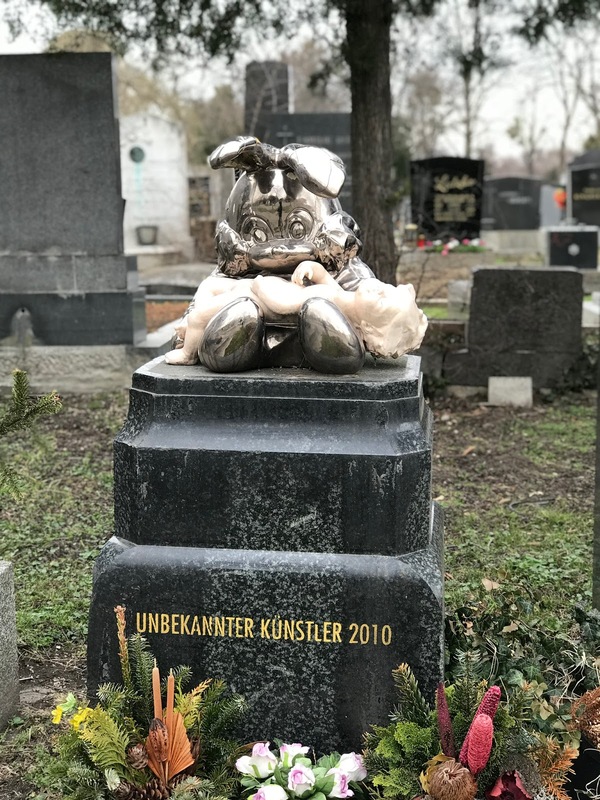 As Vienna's population approached one million in the late 1800s, it became clear that the old communal cemeteries in the various municipal districts could no longer handle the burial needs of the rapidly growing capital city. 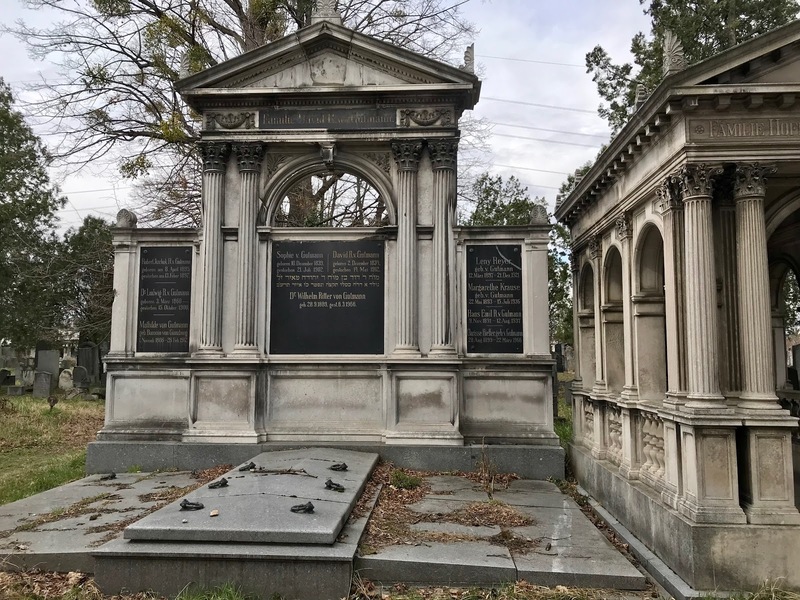 In 1863, a decision was made to create a much larger graveyard to serve the burgeoning demand for resting places. 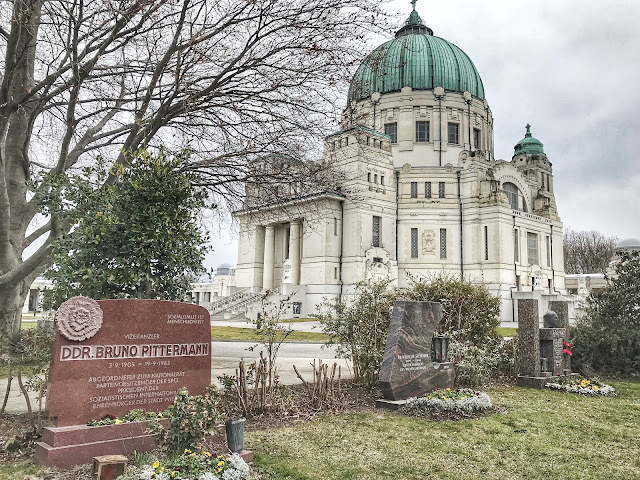 Set far outside the city's borders, Central Cemetery was opened in 1874 with a name that reflected its importance as Vienna's largest cemetery rather than referencing its location. 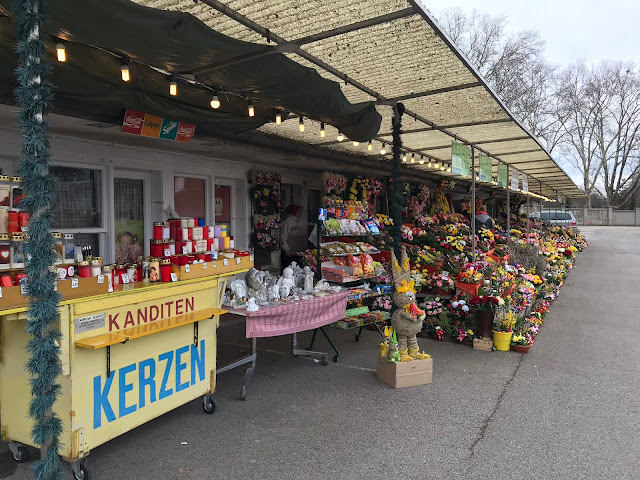 At 620 acres, Zentralfriedhof today is one of the largest cemeteries in the world in terms of burials. More than three million people rest within its borders in 330,000 graves. That's almost twice the size of the city's living population. 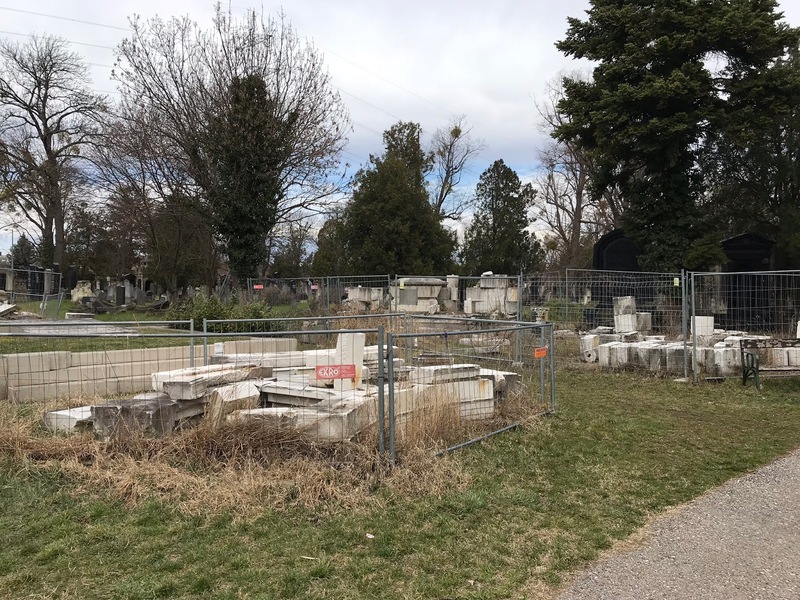 Growth continues as the cemetery averages 25 new burials per day. Unlike more localized burial grounds, Zentralfriedhof (Central Cemetery) was established to serve people of all faiths, a radical concept in its day which was met with fierce resistance. The ecumenical spirit prevailed and flourished. 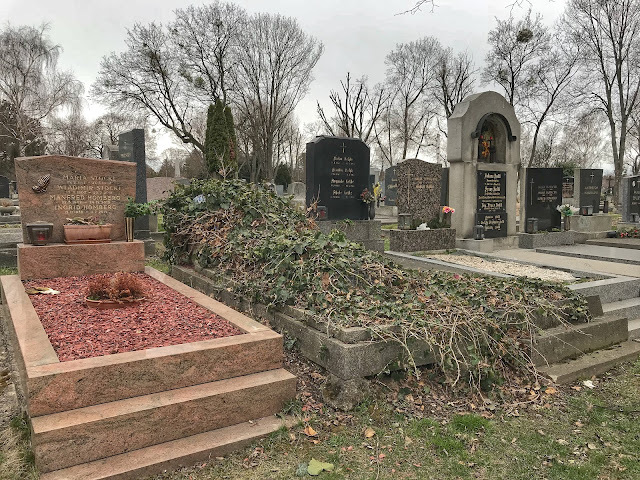 Today, in addition to the predominant Catholic cemetery, Zentralfriedhof embraces Christian Orthodox cemeteries, a Protestant cemetery, two Jewish cemeteries, a Muslim cemetery and a Buddhist cemetery. 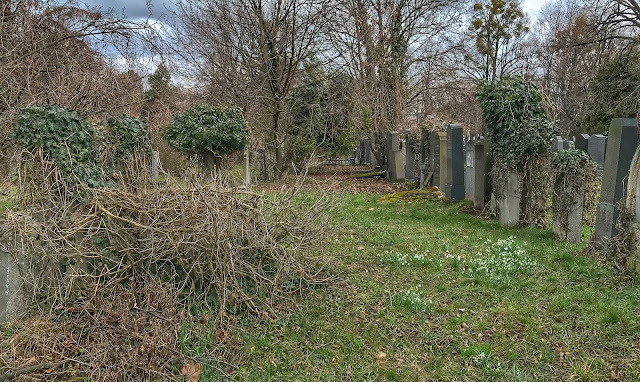 Parts of the older Jewish cemetery, established in 1863, were destroyed by the Nazis during the Kristallnacht, but many graves remain intact. The second Jewish cemetery was built in 1917 and is still in active use today. Historic artifacts date Vienna's Jewish community back to the 12th century. By the early 1900s, the city was one of Europe's most prominent centers of Jewish culture. In 1938, the city's Jewish population approached 200,000. But during the period of National Socialist rule, more than 130,000 Austrian Jews were expelled or escaped and more than 65,000 were murdered by the Nazi government. By the end of the war, the once flourishing Jewish community had been reduced to a few hundred people. This tiny community was unable to care for more than 100,000 Jewish graves in Zentralfriedhof. This somewhat neglected section of the New Jewish Cemetery is a big improvement. 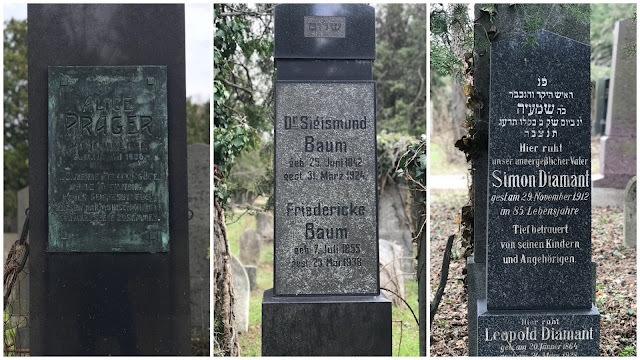 When we first visited this cemetery in 1985 in search of Ken's ancestors, we were appalled by the tangle of vines and trees and bushes all but covering most of the graves in the Jewish section. We were able to find Ken's grandmother's grave only because his parents paid a local person to keep it maintained. 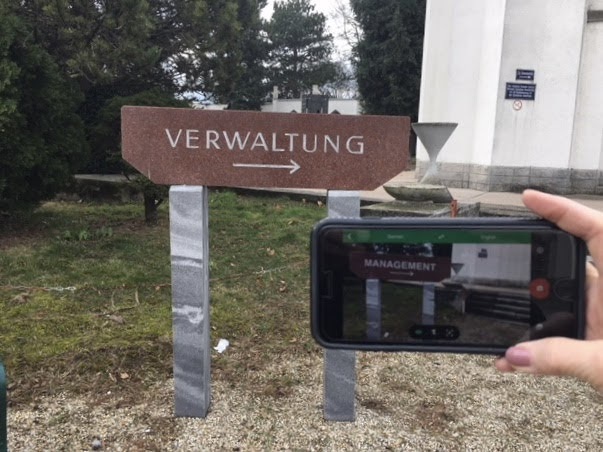 Not until 2001 did the Austrian government take responsibility for crimes committed and property confiscated by the government during the Nazi period. Finally in 2010, the government established a fund for the restoration and maintenance of Jewish cemeteries. Though far from well-maintained, the condition of the Jewish cemeteries is much improved since our 1985 visit. As we wandered the lanes searching for markers, we encountered Elsa, a local woman who volunteers with a non-profit organization called re:Member Vienna. 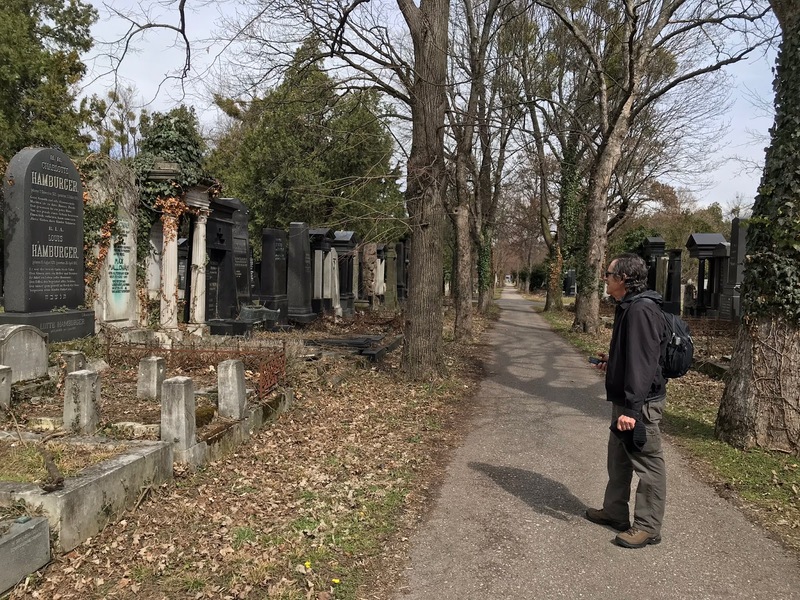 The group's mission is the rehabilitation of the Jewish cemeteries in Vienna and the establishment of a database with information on burials complete with photographs of the graves. Thanks to the lengthy period of neglect, there are still rubble-filled sections damaged by bombs during World War II. At least today, they're fenced off to protect the remains and safeguard visitors who might be injured exploring them. Through the magic of the genealogical web sites, we came to the cemetery armed with some basic information on the locations of family graves. Thanks to the orientation given us by Elsa on how to find the damaged section markers and guesstimate when row and grave markers were missing, we were able to locate the graves of Ken's paternal grandmother and her parents, a set of paternal great-grandparents, both maternal great-grandmothers, a maternal great-grandfather, and one maternal great-great-grandfather. Near his grandmother, we stumbled upon a paternal great aunt and uncle whom we weren't even looking for. It was quite a magical experience to come so far in both time and place and be able to locate these ancestors' resting places. 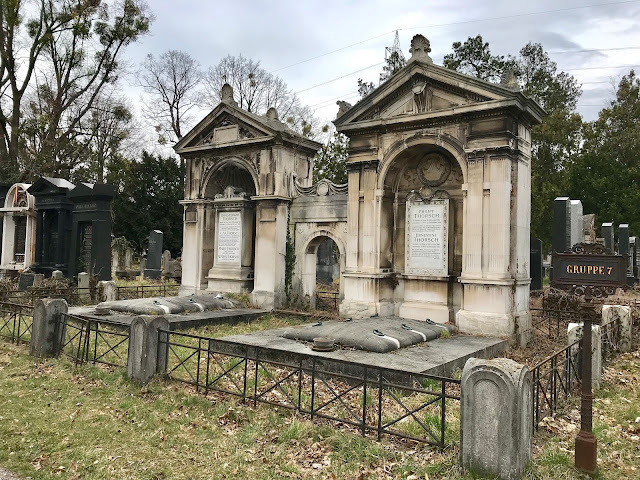 In the main (Catholic) section of the cemetery are some graves that receive many more visitors than these family graves. 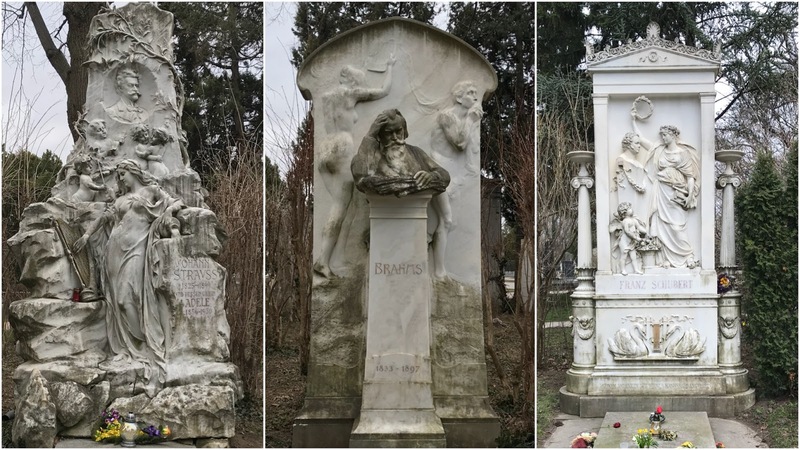 Since Zentralfriedhof was located so far out of the city, authorities established sections for graves of famous people to lure visitors to make the long journey. One such section features the graves of some of history's most famous composers. Though most of these composers were not natives of Vienna, they came here to work because the city was the center of the western classical music universe in the 19th century. In addition to other less well known musical geniuses, Beethoven, Brahms, Schubert, and both the older and younger Strausses are here. 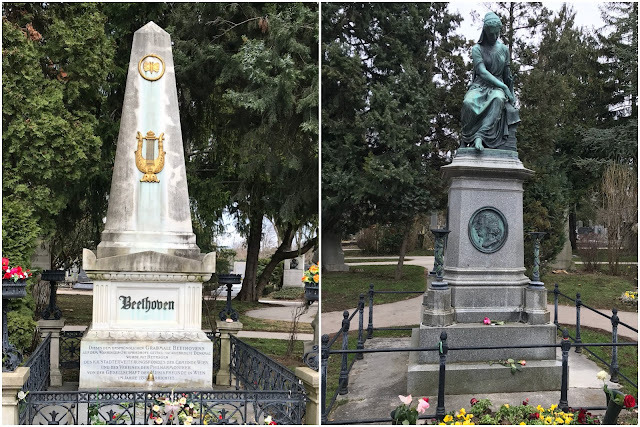 Mozart is buried in an unknown location in another cemetery in town, but a cenotaph (empty tomb) was erected in his honor between Beethoven and Schubert. 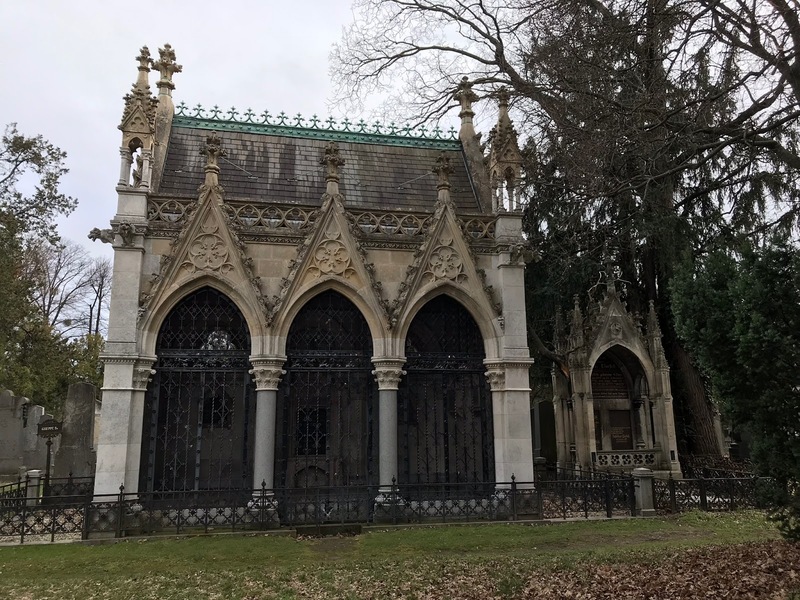 As would be expected, a cemetery this size encompasses a rich variety of funerary architecture. Some monuments look like three story houses, others like miniature churches. Some include heart-wrenching epitaphs and sculptures, and many are grand and imposing. And there are also the whimsical. An Easter Bunny look-alike with a doll lying across its lap seemed odd even after we obtained a translation of the inscription: "Unknown Artist, 2010." Apparently this pedestal was erected between two graves in November of that year. Cemetery officials deny any knowledge of its origin but say they'll leave it be as long as it doesn't bother anyone since the space between the tombs belongs to the adjacent tombs and not to the cemetery. Outside the cemetery vendors sell candles and flowers to mourners visiting their dearly departed. As far as we observed, the musicians received a lion's share of the floral adoration. Our Zentralfriedhof visit began in the old Jewish cemetery on Thursday , but the new Jewish cemetery had to wait until Friday since we arrived just as it was closing the previous afternoon. 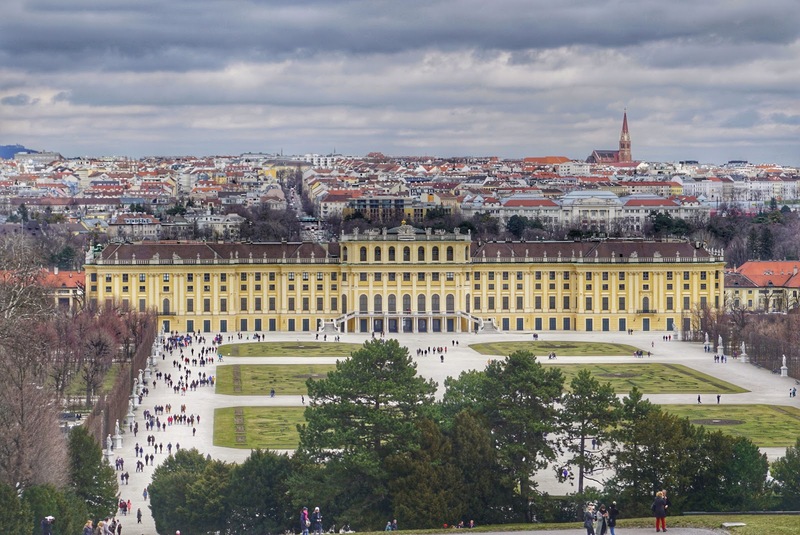 When we left the cemetery on the second visit, we hailed an Uber to take us to Auhofstrasse, a suburban street near the famed Schönbrunn Palace, the opulent summer home of Austria's Hapsburg royal family. In fact, the street takes its name from a former imperial hunting lodge. Our interest in Auhofstrasse was Ken's mother's childhood home located at number 19A. Since she had a painting of the residence in her home, we had no difficulty recognizing it. Today it is surrounded by a fence and—based on the doorbells at the gate—is divided into three apartments. As it was when Grandma lived there, the Polish embassy sits next door. Since we were in the neighborhood, we also stopped by Schönbrunn Palace but skipped the tour as we had done it last time we visited. We did, however, find a letterbox on the grounds. By the time we left, there were two. Tomorrow will be our last full day in Vienna before we move on to Slovakia's capital city. 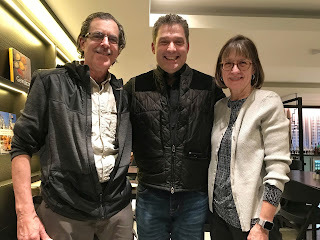 Loved: Making connection with family members long gone. Lacking: Perpetual care. As it is practiced in the US, prepaid maintenance by cemetery personnel would have ensured that Jewish sections of Zentralfriedhof would not have been allowed to become overgrown jungles. Fancy Missing You Here: When we were in the hotel's lounge Wednesday evening, a group of three women and one man came in and sat at nearby tables. One of the women was quite boisterous and loudly told one story after another, allowing no one else to get a word in edgewise. We kept our heads down, tried to ignore the racket, finished our drinks and departed. Later that evening, we had a text from a good friend in the States wanting to know if we were at the Hilton hotel. Yes. She informed us that her friend, whom we had met a couple of months ago, had sat next to us in the lounge and thought he recognized us. On Thursday we connected with him and had pre-dinner drinks with him and his business colleagues in the very spot we had sat the previous evening. Doc Around the Clock: Thursday morning I woke up with a puffy right eye. Though the eye itself was okay, the upper and lower lids were filled with fluid. A day of self-prescribed antihistamines and ibuprofen did little to mitigate the swelling. When it seemed much the same Friday morning and with the Easter weekend and a Monday bank holiday looming, we decided to seek medical help. The hotel concierge called for a doctor and told us to expect a house call in our hotel room in an hour. Sure enough, at 8:45, Dr. Zouhar, a perky 30-something physician in jeans and red sneakers, knocked on the door as promised. After an examination, she filled out a form we could submit to our insurance company and wrote a prescription for a steroid ointment. Then she pulled a credit card machine out of her medical duffle bag, accepted our payment, and went on her way. But only after letting us know, in her flawless English, that a pharmacy that could fill the prescription was across the street and would provide the meds immediately without the usual wait that occurs Stateside. We learned that this practice has doctors with a variety of specialties who serve the needs of tourists and river cruise passengers. The convenience couldn't have been better. 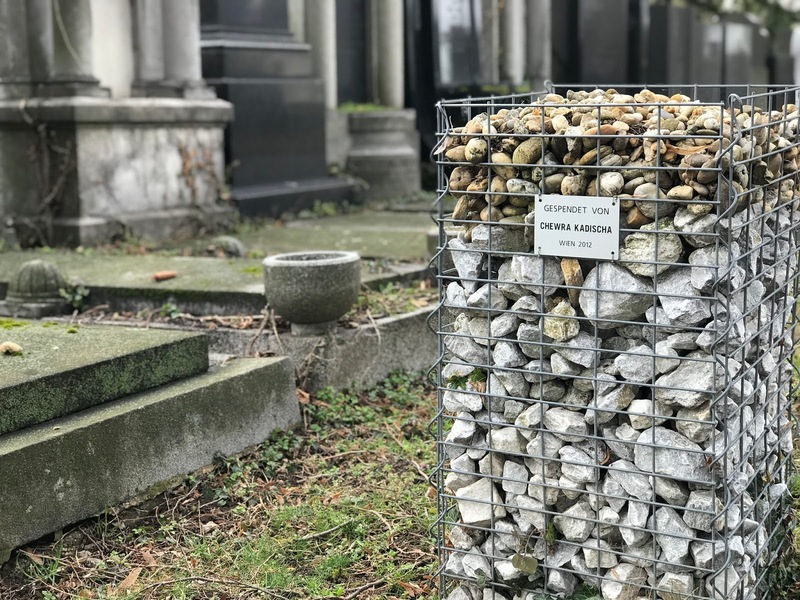 Memory stones were provided for visitors in the new Jewish cemetery. 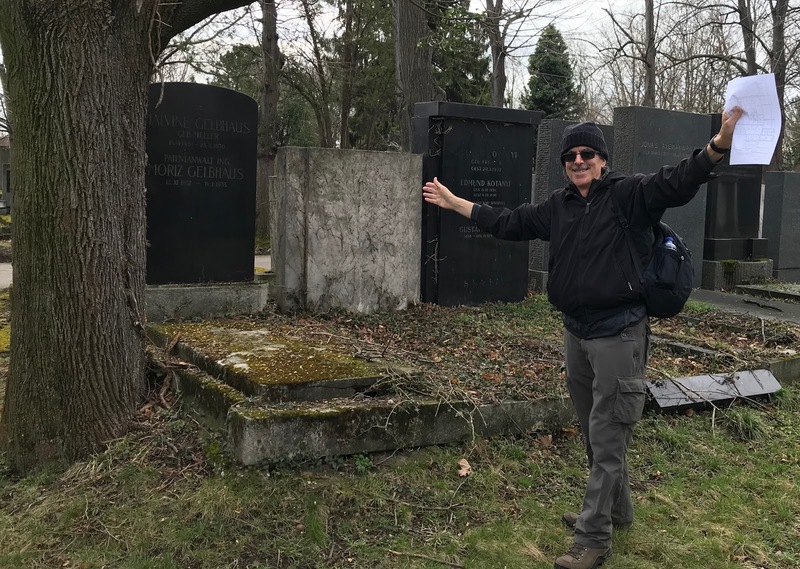 Of the six grave sites we tracked down, Ken found only one and was very proud of it. 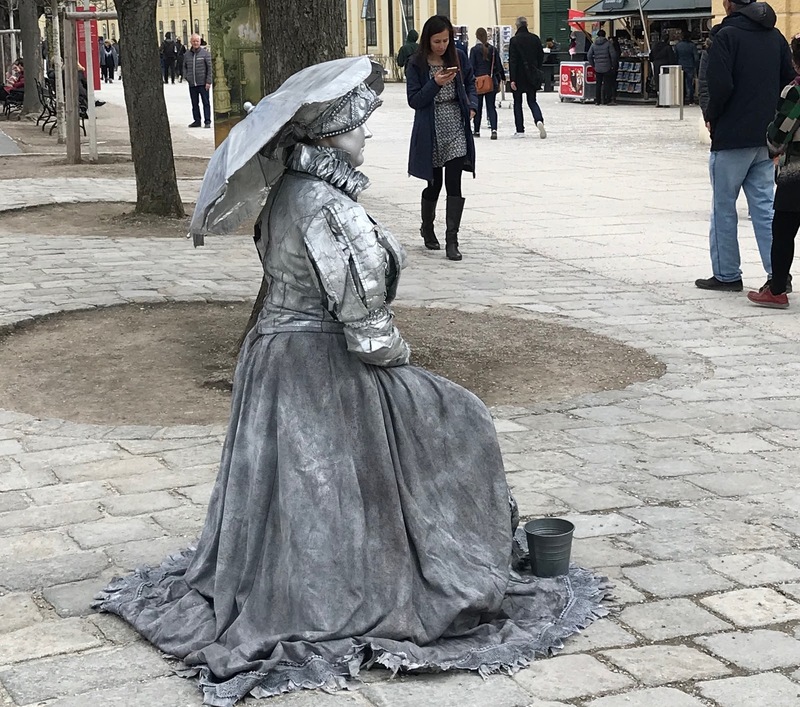 Living statue hoping to make a few coins posing with tourists at Schönbrun.